Great improvement. 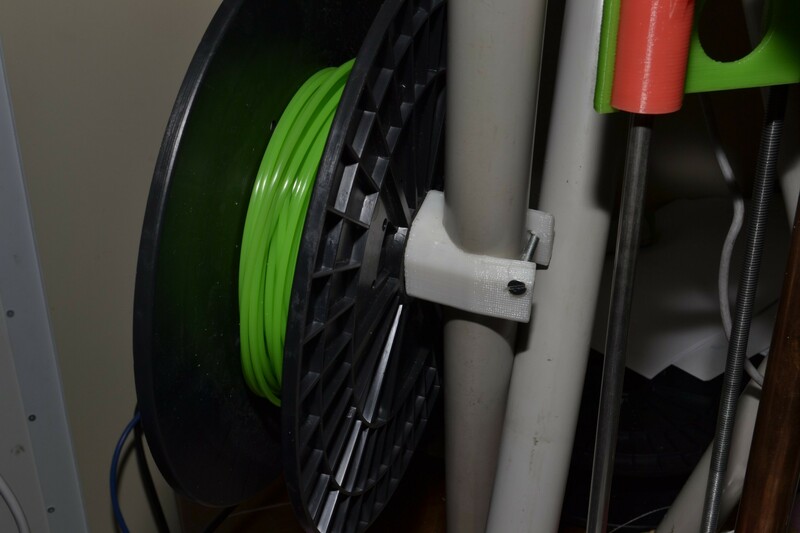 I can now retract filament at 50mm/s, improving prints quite a lot in terms of ooze prevention. Of course, a nice new extruder needs to be celebrated… with the obligatory Spool holder – mounted right below the extruder. The obligatory spool-holder, just below the extruder on the left side support pipe. Hah! Eckertech! 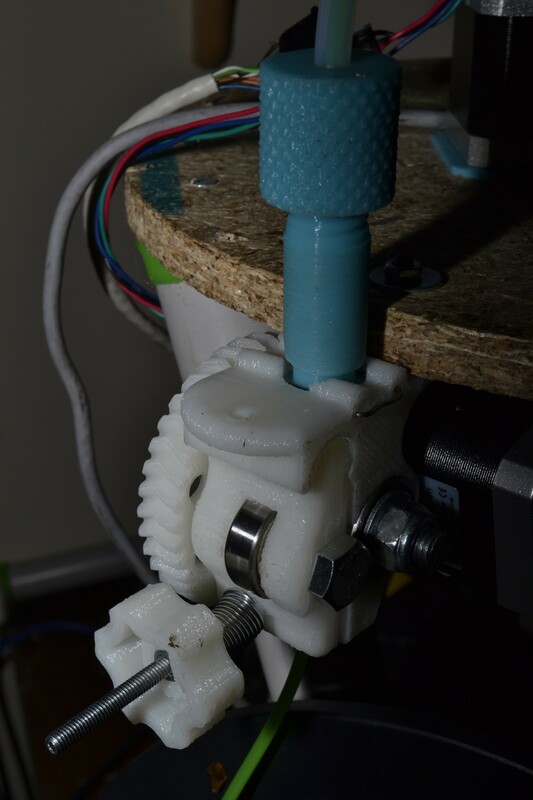 My home built RepRap is a Ecksbot built from scratch (sourced parts from various vendors). Sadly I wasn’t very pleased with the outcome (X and Y carriages were poorly designed in my opinion). So I’m tearing it down and rebuilding as a MendelMax. The springs I had already (bed leveling springs), and since the extruder is stationary, the extra long tensioner works surprisingly well. You can take out the idler without taking any other parts off – just loosen the thumb screw, pull and slide. The Ecks I was using up until now is a bit of a frankenstein monster already, held together with cable ties and clamps, but for all its faults, the eckstruder itself is very well designed, reliable and easy to print. The prusa version of it works very well on the platform, and this will also allow you as builder to choose a different extruder for your build. Unfortunately, sourcing parts from lots of different vendors and using inferior products can result in problems when building different types of RepRap 3D printers. You should ask cassetti how many types of electronics he has gone through while building his printer. @ cassetti: If you had an issue you could have easily asked us how to fix the problem. Given that you were printing the parts yourself maybe there was an issue with the prints. You never expressed any problems when we were chatting several months ago. PS: consider using the herringbone gears that I put together. I might merge the two in order to get your large gear, with the herringbone gearfaces. Works a treat, and quiets down the extruder a lot. Jip, its a J-head mount. The current Eckstruders are all for j-head… I guess they learnt their lesson? Actually, our hot end is one of the best on the market today. The eckstruder was built so that any reprapper could use it with most any hot end design. We felt that it wasn’t fair to only make it work with our specific hot end, especially since it is based on Wade’s original design. We have been using this hot end for 4 years and have never had an issue with constant jams or the inability to extrude. The problems that cassetti is having is probably improper temperature, the nozzle needs to be cleaned properly or he isn’t actively cooling the the hot end with the provided fan. Given that he hasn’t asked for help in solving this problem I can only assume it’s one of these problems. If I could change wades, or gregs for that matter, it would probably turn out to be Ecks… And that is why I chose it as my extruder for Morgan. Thanks for sharing your design, and I will certainly link to your sources when the BOM for Morgan comes out. As for the hot-end, J-head is what is available here, and it has proven to be quite reliable. Any plans to have an ecks hot-end available in South-Africa? You will also be pleased to know that the Reprap mother of the first Morgan was an Ecksbot. Thanks for the support, Quentin. We don’t have a distributor in South Africa. However, the hot end is actually available to ship worldwide on our stores website. I’m always happy to see when someone is using ecksbot parts for their own designs. I just felt the need to defend our hot end.